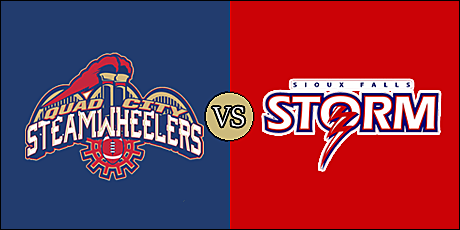 What: The Steamwheelers are hit the road to face the Storm. When: Friday, March 22 at 5:05 p.m. pacific (7:05 p.m. central). Where: Denny Sanford Premiere Center; Sioux Falls, South Dakota. 2019 Head to Head: May 4 - Storm at Steamwheelers. Note: This is the home opener for the Storm after playing their first three games on the road.. The Steamwheelers are 2-1 overall and 1-1 on the road. They are coming off a 58-36 road win over the Cedar Rapids River Kings on March 15. The Storm are 3-0 overall and 0-0 at home. They are coming off a 52-18 road win over the Bismarck Bucks on March 16. This is the first overall meeting between the two since the Steamwheelers came over from Champions Indoor Football during the off season. Aside from a hiccup against the defending champion Iowa Barnstormers, Quad City has been productive through the early part of the season. 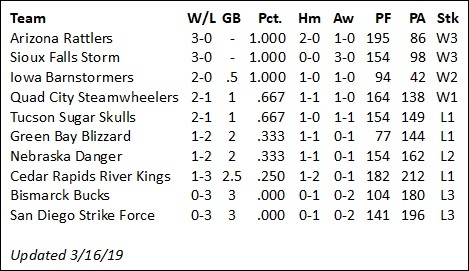 With wins over the San Diego Strike Force and Cedar Rapids River Kings, the Steamwheelers wind themselves in the upper half in the IFL standings. They will face a major test against the always stalwart Storm, who have been impressive in all three of their wins this season. With wins over the River Kings, Nebraska Danger and Bismarck Bucks, the Storm are riding high with a perfect 3-0 record. Aside from their come-from-behind win over the River Rings on a last-second field goal, the Storm have dominated in all three wins. This one is the home opener for the Storm. Quad City quarterback E.J. Hilliard is second in the with 178 passing yards per game and tied for first with 12 overall passing touchdown. He is completing 62.5 percent of his passes and has yet to throw an interception through the team's three games. Hilliard can also be potent on the ground, having accumulated 87 yards on 20 carries with three touchdowns. Carlos Wiggins comes in averaging 6.9 yards per carry and a touchdown. He has emerged as the featured back, and last week the Steamwheelers utilized backup QB Dillon Turner in the running game. Turner spent last season as backup to the Storm's Lorenzo Brown, Jr. Quinto Pedroza has caught 13 passes for 225 yards, Keyvan Rudd has 12 catches for 176 yards. Both have five touchdown catches. Defensive back Danzel McDaniel leads the team with 26 total tackles. Fellow DB Everett Nicholas has two interceptions, and three players have recorded sacks. The team signed Kenneth Rowe to handle kicking duties prior to last week's game, and he responded by going seven of eight on point after attempts and hit his only field goal try of the night. 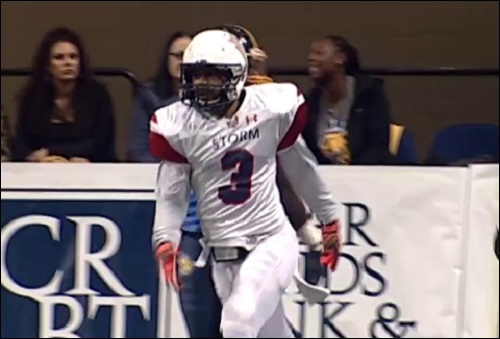 The Storm are one of the more experienced and balanced teams you're going to find in the IFL. They feature a balanced attack on offense, led by Brown, who is averaging 154.7 passing yards per game. He's completing 61.1 percent of his passes with six touchdown and a single interception. Brown has rushed 26 times for 90 yards and four touchdowns, while Darrian Miller leads the team in rushing with 118 yards of 25 carries with four trips to the end zone. The Storm have a solid receiving group led by Brandon Sheperd's 14 receptions for 236 yards and three touchdowns. Damian Ford comes in with seven receptions for 103 yards and three scores of his own. Defensive back DeAndre Scott leads the team with 17 total tackles, an interception and a forced fumble. Fellow DB Matt McKoy has an interception, and linemen Charles Williams and Kanyia Anderson each have tallied a sack through the Storm's opening three games. 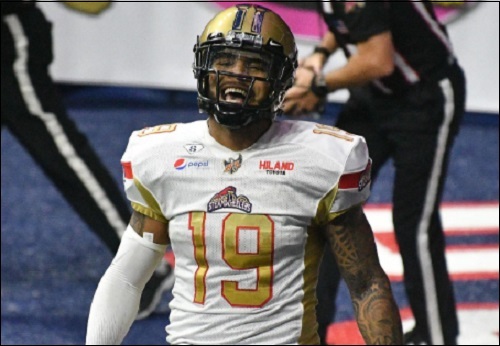 Miles Bergner is the top kicker in the IFL, having made all 18 of his extra point attempts and seven of 10 field goal tries, with a long of 54 yards. Storm win the toss and will defer. 'Wheelers to receive the opening kickoff. Touchdown Steamwheelers. Quinton Pedroza 8 yard pass from Dillon Turner. Kenneth Rowe kick. Touchdown Storm. Damian Ford 26 yard pass from Lorenzo Brown, Jr. Miles Bergner kick failed. Touchdown Steamwheelers. Quinton Pedroza 2 yard run. Kenneth Rowe kick failed. Pedroza might be in for another monster game. Huge sack by on Brown. Touchdown Storm. Brandon Sheperd 29 yard pass from Lorenzo Brown, Jr. Miles Bergner kick failed. Nice first quarter. Missed extra points could be key at the end. FG try by Quad City foiled by a bad snap. John Prather with the catch; first of his career. Touchdown Storm. Lorenzo Brown, Jr. 3 yard run. Miles Bergner kick. Touchdown Steamwheelers. Keyvan Rudd 39 yard pass from E.J. Hilliard. Kenneth Rowe kick.